Each Edition set is of six hand thrown and hand painted ceramic koans. Each koan of a set is numbered and signed by the artist. In order to create each edition of Mountain Koans, multiple layers of colour are laid on the cone as it revolves at a high speed. Finished and taken off their turntable, the cones still appear to be spinning. One is seeing the traces of motion on their surface. A koan is the Japanese word for a riddle given to novice Buddhist monks. Pondering the insoluble paradox is a path to a clear mind, a path up the mountain. Lijn made the original works in 1995, painting mahogany cones in repeating layers of innumerable colours. 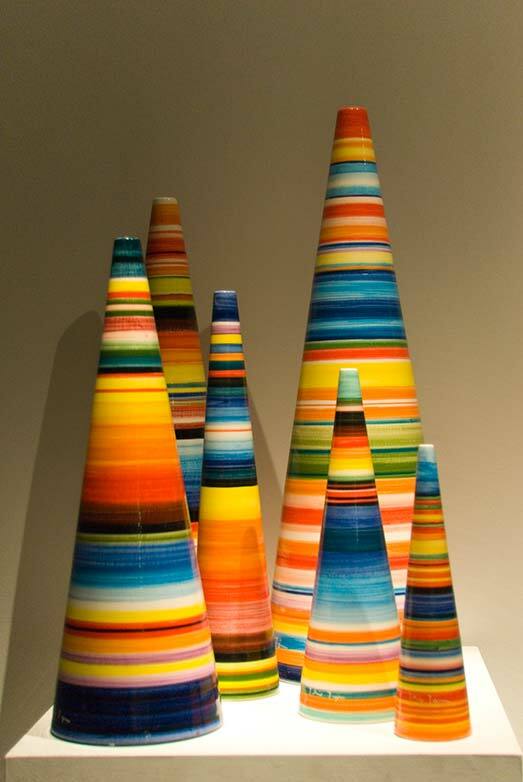 She called these works Striped Cones, in memory of two such cones she had made in cork in 1960. The early cork cones were exhibited in 1966 in In Motion, an Arts Council touring exhibition of kinetic art curated by Guy Brett.